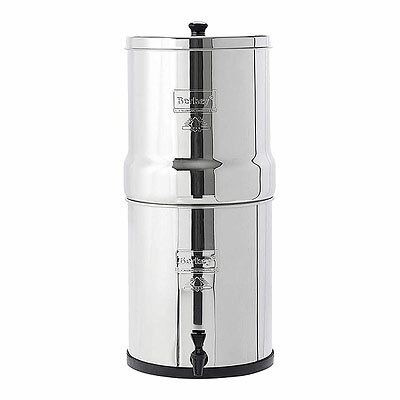 Do you have a Big Berkey water filter? Are you wondering about the difference between the White filter element and the Black filter element? Though the black filters are standard today, the white filters are still out there. It was confusing because some of the Berkey water filter systems used to come with white ceramic filter elements while others came with “Black Berkey” purification elements. A man named Henry Doulton of Britain developed ceramic filter technology back in 1827. Over the years the Doulton company improved their water filters to include not only bacteria removal but also self-sterilization. Their “gravity filters” became popular and used by military, relief, and even missionaries in faraway lands lacking clean drinking water. Note: A gravity filter is one whereby an upper reservoir of impure water is filtered into a lower reservoir through a filtration media. Gravity does the work as the water flows from the top reservoir through the media to the bottom reservoir. During 1985 a company named “British Berkefeld” acquired the Doulton company and their “White” ceramic filter technology (technically called “Super Sterysyl Ceramic”) and began selling to the public. British Berkefeld continues to sell their “White” (Super Sterysyl Ceramic) water filters today through a North American distribution partnership developed in 1998 with the US based company “New Millennium Concepts”. New Millennium Concepts then expanded this filter technology into what is known today as the “Black Berkey” purification element. They also expanded their filter housing systems into what we currently know as the Berkey® Water Filter System(s). Evidently (based on what I’ve read from the respective companies) the Black Berkey and the White (Super Sterasyl Ceramic) filter elements (also called “candles”) both are excellent water filters. Though the Black Berkey is superior. One of the differences is the Black Berkey elements remove more chemicals including Lead, MTBE’s, and other heavy metals, as well as filtering out more bacteria and viruses. The Black Berkey has been tested by a number of independent laboratories. The Ceramic shell of the Super Sterasyl element is an NSF Listed Component and is manufactured to meet NSF standards 42 & 53 for materials. Additionally, the Black Berkey elements will also filter out Chlorine to undetectable levels. The White ceramic filters will remove ~ 90% (still good!). Lifespan of the Black Berkey (set of 2) is 6,000 gallons. Lifespan of the White Super Sterasyl Ceramic (set of 2, 9″) is 1,200 gallons. Over many years I have used both the White ceramic and Black Berkey filter elements. In fact I still have a spare set of White’s along with a set of Black Berkeys. I’ve never had a problem with either one. I own a Big Berkey water filter system and a British Berkefeld. Have been using the Big Berkey every day for our drinking water for many years. Despite the fact that I have a well water system (actually it’s a dug well into a natural spring) and a whole-house filter to 1 micron, I still use the Berkey for even “better” water! EVERY SINGLE PREPPER should have a quality countertop water filter designed for daily use. Water is THE MOST IMPORTANT consideration for general preparedness and we should not take it for granted that we will always have a safe clean source of water. There are many good water filters out there. I may be somewhat biased having owned Big Berkey water filters for many years, however I stand by them as one of the best. Nice article, thanks Ken. I too have a Big Berkey but given that “two is one and one is none” wonder if there are less expensive options for a second or backup tabletop filter? Look on Camping Survival one of the advertisers on this site. They sell a kit to make a two 5 gallon food grade bucket filter with there kit. You supply the buckets and drill holes and assemble, very simple. We have one that is still in plastic bag inside buckets with holes drilled ready to go. It would be a back up to our Berkey Lite we use everyday. Two is one and one is none! Sorry I gave you the wrong site it’s Camping Survival.com but I checked there site. Called them and it was safety issue that they don’t carry that product anymore. People were using any old buckets and stores will tell you buckets are food grade even when there not. Frosting buckets as supplied to bakers will split and you will never get the taste out of deli buckets. I use the food grade buckets(round), and have a water filtering systems using these buckets. When they are brought home I wipe them out with paper towels to remove the food products inside then put on my rubber gloves to use full strength Dawn dish soap to wash the insides. I do this outside in the summer time when it is hot enough for air drying. If they do not pass the squeak test they are washed again. Even if I bought buckets from a grocery store they would still be cleansed this way. I do not use the square frosting buckets for water, those I use for books. Only the round they holdup better for a longer time, the only failure is the handles or bails to carry them around. I have an unused Katadyn drip unit from the 90s. Got extra filters last year. of the filters one time. I’ve used about 10+ gallons per week. I am not near the end of filtration life when concidering volume of water. I am wondering about the time frame. I’ve been using mine for a year and the flow is still the same. With our usage the filters should easily last five years. I did have a problem a few weeks ago with the (I thought) filter element hissing. Rather panicked when I looked online for this problem and found it to be a MAJOR problem (filter failure, filters crumbling or coming apart). But when I checked the unit the filters were fine, still draining without a problem, and when I heard the hissing again I investigated. Because the unit is self-contained, condensation can build up around the lip of the unit and seal the edge. What I was hearing wasn’t the filters, but the water “seal” venting when the pressure inside got too high. A twist-tie over the edge of the bottom tank solved the problem. “Water, water, everywhere…….and not a drop to drink”. 3 minutes w/o air, 3 hours w/o shelter, 3 DAYS W/O WATER. I came to the conclusion several years ago that boiling every drop of drinking water for my family’s survival, in the event of catastrophe, would be a huge drain on precious energy and time. I bought my Big Berkey to address this problem prior to having to face it for real. No one in my house drinks water from the tap. It is automatic for us to fill our glass from the spigot. We have no well. We do have one year-round spring about two hundred yards from our home, down hill, that in worst case could supply us with drinking water, but would be labor intensive getting it to the house. I’ve installed a 305 gal cistern with rain gutter fill capabilities. The Berkey solves any question of the safety for drinking from this source. If you read the history of the Berkey system’s use in Africa, you will discover that it renders safe water from some pretty nasty sources. I consider it my premier prepper appliance for long term, home base survival. I am about to purchase the kit to construct a system using food grade buckets, for increased purification capacity, as my plans call for my children/grand children to collapse back to home-base in case of the unthinkable. For the difference in price, I think the extra money for the black filter is a no-brainer. Think viruses and the havoc they can wreak. Dennis, you might look into putting in a “ram” pump on that spring, depending on the “flow” of water. A RAM pump uses no electricity, it uses water pressure to pump the water. I know that for many, saving every penny possible is paramount, but when it comes to food grade buckets I think that going around begging for them at businesses that discard them is cost ineffective. I buy mine, new, with lid, at WallyWorld for less than $5. Even though they are located in the paint department, they are clearly marked/branded as food grade. I made it a habit over a year ago to buy a bucket, lid, 20lb rice, and 4lb beans/peas (less than $15 total) until I had one for each member of the family. As @Southernman pointed out, rendering a food grade bucket that has had food products in contact with the surfaces safe from bacterial growth can be iffy. Just my thoughts. Maybe Ken could do a refresher post on how to identify food grade buckets. Like I said, found them in the paint department cheap, and knew what markings to look for. Dennis, Lowes and Home Depot also sell food grade buckets in the paint dept. Thanks for the information, Ken. I can definitely see the advantages of a gravity fed filtration system if filtering water on a daily basis for a long term situation is necessary. I currently have a Life Straw and purification tabs in my GHB and a Katadyn Guide filter that I use when backpacking, camping, etc. Right now, there is a brand new filter cartridge in it, and two more with my backup supplies. I am wanting to get another water filter (two is one). I have been eyeing the 10L Base Camp Pro, which uses the same filter as my Guide, and is a gravity fed filtration system. I know that many people here love the Big Berkey. I am wondering why everyone loves that model so much, and whether it is worth the substantial extra investment. It seems to me like having a pump unit and a gravity fed unit that use the same filter cartridge would be a better way to go (for me). I would love to hear everyone’s thoughts on this. Thanks. I wanted something that wasn’t electric, didn’t have to be tied in to the faucet, would filter out viruses and bacteria, chlorine and flourine, and had few plastic parts/no moving parts. Plastic degrades, moving parts wear out. If pumps don’t work or the water gets shut off and your filtration system is either electric or tied to your faucet, it’s useless. Excellent points, think Off-Grid when thinking ‘stuff’ like this, no outside support for 10 years….. I also keep three sets of extra filters, which under normal (i.e., current) usage should last me about thirty years. If we have to start filtering unclean water I figure they’ll last about three to five years, by which time if we haven’t figured out another alternative we’re SOL anyway. Thanks for the info I have been looking for food grade buckets and never would have thought to look in paint dept of Wally world. I just checked my buckets. All were food grade except the last one I purchased. It appears to be the same bucket as the ones marked as food grade, but lacks the fork and glass identifier. It does have the triangle with the numeral 2 in the center indicating it is made from HDPE plastic used for food grade containers. Don’t know why the change or if it is unsafe for food storage. Check before you purchase, let your conscience (or a more knowledgeable person than me) be your guide. Thank you for this great information, it’s so helpful! Would there be any reason or need to use the ceramic and black filters together? How do you know when you’ve reached the 5,000 gallon mark and need to change the filter? By averaging your daily usage and then “doing the math”. If you use about 2 gallons a day, then you will have consumed 5,000 gallons in 6.8 years. I, like many here it seems, also have a Big Berkey. I use the Black Filters, the replacements are a little more pricy (I keep one set of replacements in stock and well protected from damage), but I’ve run many Many MANY gallons through it so far and have yet to use the replacement. When in another 5 years I need another set, I’ll buy the Black Filters again. I would recommend as a backup, Sawyer Mini filters. At about 1/10 the cost of a set of filters and 1/20 the cost of a second unit. AND ya can keep them in various “Bags” and have them with ya all the time if needed. Some talk of the homemade kits for a full sized unit, ok I guess, but the original Stainless Steel Berkey is mighty dang tough to destroy. Having a second set of filters should do ya for ohhhhhh about 10 years or so and indefinably for the Berkey ‘Can’. Drip Drip Drip goes the fluid of life, get a Filter System, water now days is NASTY!!!! Even worse to gunk that comes out of your faucet; remember the Orange Animas or the Lead Pipes in of Flint or the hundreds of other contaminated water supplies from the .gov….. Ya want to stay healthy, stop drinking the ‘supplied’ water and clean it up. How many times do we hear of a “water supply contaminated” even with e-coli…. Talk about NASTY!!!! FYI, Chlorine the .gov uses to ‘clean’ the water, is poisonous, as is the Fluoride, lead, Zink, copper in excess, and so on, get a water analyses done on your tap water, than look at what is believed to cause Cancer……. Hello NRP! So in the last few days, we’ve been notified that our drinking water “pulled from the river” has a new unknown chemical in it. It’s coming from a factory who had the okay to dump into the river, now the crap they dump has been “determined” to be dangerous. How about factories not be allowed to dump dirty “water” into a river and then city water systems and citizens who drink the stuff be responsible to remove it before we drink it! Crap! Just crap! I do have a Berkey with black filters. So, I’m okay. But, I’m surrounded by those that don’t (probably). I’m sure the stores are selling out of bottled water by now. Dang, just dang! More on the water toxin “discovered” in the Cape Fear River. They’re calling it GenX. It’s a perflouroalkyl. Used in the making of Teflon. I’m worried that my well may even be contaminated. I doubt the well water “inspectors” can detect GenX in the water. I also doubt that the Berkey will filter it out. I would send water samples out if I knew who to send them to. luv ya’ll, Beach. Try a local college chemistry department (qualitative/quantitative analysis) and see if they will do it for free. So I am guessing that if I use bleach in my stored water, you would recommend filtering with a Berkey before consumption? Bleach will kill a lot/some of the ‘bugs’ in the water, but it does not remove the other nasties, if storing water I would still defiantly filter it. We’re on well water and when we bought the house, the first water test failed due to e.coli. The second water test passed and being early Spring, either there was a contamination due to weather or due to lack of use because the owners were divorcing and no one lived here when it was up for sale. Regardless, we had small kids, including a newborn, so our first home improvement was to add the ultraviolet treatment for our water. We used that system many years. We now use the Berkey system and have only used the black filters. We’ve never had a problem with the filters. I have only been cleaning the filters once a year — should I go to twice/year? The only issue I ever had with our Berkey is that once I ‘overfed’ mine with too much water. That drip,drip,drip was onto the floor! We have porcelain tiles, so no big deal. Berkeys now have a water gauge so that dummies like me don’t make a big water mess on the floor. We have a backup ceramic water system with the food-grade bucket and a ceramic filter. I’ve not used it, but it’s there if needed. We also have LifeStraws in our GHBs. We keep a set of Berkey black filter replacements and I’ve been thinking of getting yet another set because we’ll be about ready to replace our current filters this coming year. We have very hard water and use a water softener. We also have a filter for our system before the water goes through the pipes. That filter cleans out an enormous amount of rust/iron and ‘crud’ — it’s truly disgusting to look at that filter (it’s changed monthly). The Berkey is the final-phase, right before we drink the water. What a great water filtration system the Berkey is. So simple, yet so effective! Our water filter system is two FG buckets and a Doulton white filter with a spigot. Put this together years ago for the JIC. After reading your article will try to have one transferred in to the The state of Jefferson. Berkey’s are outlawed here, for some odd reason, but that is ok. A little outlaw mentality is good for the soul. We have had a Berkey system (four filters) for about 6 years and still works great (two people). I also did some research last year and found that the Berkey black filter system is the best on the market. I also have four extra filters stored away in our long term storage with two extra Life Straws and two extra individual filters stored away. We also manufactured a gravity filter system from stainless steel 2-gallon pots we purchased at Walmart and added two Berkey filters to the pots–cost was about $120. We use the home-made system in our camper for vacations and trips to Florida. Good article. The Black Berkey filter also removes arsenic while the white doesn’t Per the listing on Amazon. Can anyone tell me the proper way to clean the black filter elements? Ken did an article on cleaning the filters awhile back, go to his search; you should be able to fine it easily. 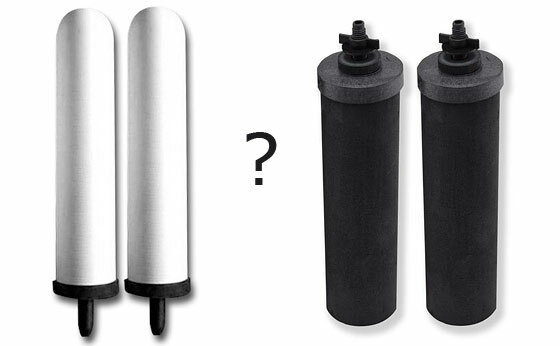 Will the black Berkey filter pool water? Chlorine along with Clarifiers, algaecides, etc. have been used in pool. Only in SHTF situation. @JustAskin, I can suggest this… If it were me in a SHTF situation and I needed drinking water whereby a swimming pool was the source, you betcha that I would be using my Big Berkey water filter (with Black Berkey elements). I don’t know of a better one than that. That said, given that people and kids are always in swimming pools and do inadvertently swallow some of that water without dying, I personally would not be too terribly worried about the pool water concern during SHTF especially if I had a good water filter. The problem I have with the black filters is that carbon will appear in the lower reservoir and into my thermos. When I clean out the lower reservoir, I get a lot of black substance on the white cleaning towel. Does anyone else experience this? If you are living in the modern world: Go for a bank of 3 filters behind the sink and feed it with tap water. If you are living in a place where you cannot count on water supply: Go for gravity filters (coated aluminum or stainless steel bodies, no plastic subject to leach…..
One thing to remember: If you leave your place for more than a month, better empty your system, clean and store the filters in a fridge for example.